Stephanie Bouquet is a vibrant modern display of fresh seasonal blooms. 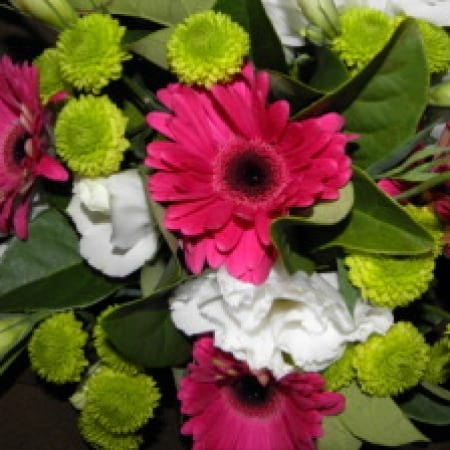 Happy bright gerberas, vibrant green chrysanthemum and the soft and classic lisianthus fill this bouquet with character and charm, a perfect way to say I Love You, Happy Birthday or I Am Thinking Of You. A gorgeous bouquet for someone special from Amaranthine Flowers By Design. Your local florist in New Lambton, Newcastle. Order online for same day delivery available to all areas of Newcastle and Lake Macquarie, including John Hunter Hospital, Newcastle Private Hospital, Lake Macquarie Private Hospital, and Mater Hospital. Delivery available six days a week (Monday-Saturday) and Mother’s Day Sunday Delivery. Include a message on our complimentary gift card or enhance your flowers with one of our fantastic add-on gifts, your selection of chocolate, wine, bears, balloons, soy candles, luxury bath soaps and many more.